As discussed in Part I, “Roots”, amid the upheavals facing New York City from the 1960s onward, many New Yorkers took matters literally into their own hands, transforming vacant lots into community gardens where neighborhood residents could grow trees, flowers, fruits, and vegetables, and find an oasis away from their often bleak surroundings. Some of these gardens simply tended by and for residents began to also sell produce directly or, later, through the City’s Greenmarket network. In recent years, more ambitious operations have grown out of these examples, aiming to establish commercial urban farming while maintaining a sustainable business model that would produce both profit and benefits for residents. These operations are in some ways very similar to many community gardens in their combination of community-focused goals with commercial activities. What distinguishes community from commercial is often a matter of determining on which side their principal interest lies. The latter two tend to be hydroponic or aeroponic, with a non-soil growth medium. Traditional soil-based farms such as Red Hook Community Farm or Brooklyn Grange have lower start-up and operating costs and utilize proven “technology”, but offer less control over production, being more at the mercy of nature. 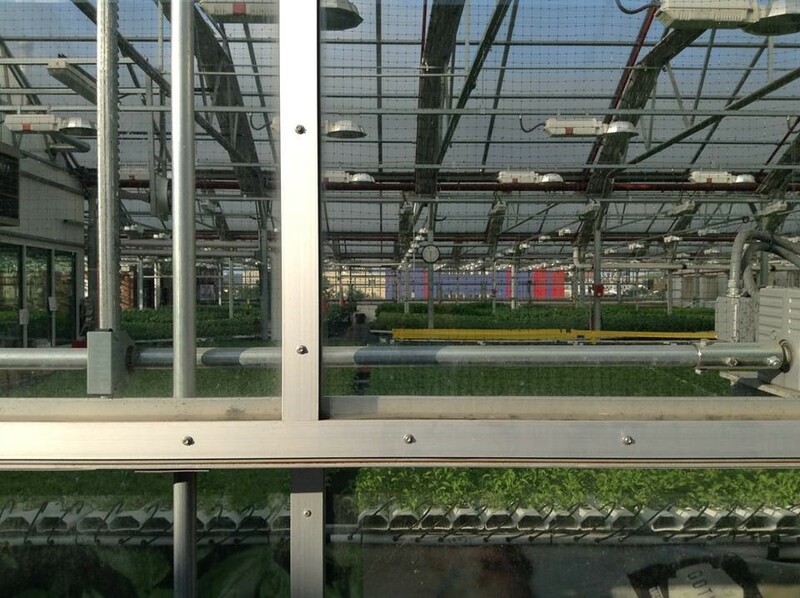 Greenhouse operations, such as Gotham Greens, have higher operating costs and require far higher initial start-up investment as well as more investment in technological development for plant nutrition and environmental controls, but provide greater productivity and production uniformity, especially if they utilize hydroponic or aeroponic systems. Non-soil-based systems, however, limit the types of crops that can practically be grown. “Vertical” operations, or those conducted entirely indoors, require the most energy and technology, and therefore the greatest relative investment, but can be done anywhere. Existing examples generally appear to be hydroponic or aeroponic. AeroFarms, not discussed here, is one example of this type of operation. Red Hook Community Farm could, in many ways, be considered a transitional step between the many community gardens that sprang up in vacant lots throughout the city and the more recent commercial farms that have made their homes on the wide open rooftops of Brooklyn and Queens. Red Hook Community Farm and its more recent sister, Red Hook Houses Farm, are run by the urban farming and food justice nonprofit Added Value Farms in the Red Hook neighborhood of Brooklyn. The Red Hook Community Farm was created in 2001 and improved after suffering extensive damage in Hurricane Sandy in 2012. Red Hook was an industrial waterfront area that later received a high concentration of public housing. Poorly served by mass transit and physically isolated by major roads and waterways, the neighborhood has come to develop its own initiatives to support its residents, one of which is the farm. It was started by a group of residents who took over a corner of the local playground, piling up dirt and growing a small garden which was gradually expanded in response to neighborhood enthusiasm for the chance to enjoy fresh produce and teach area kids about gardening and nutrition. The entire space now covers approximately 2.75 acres, with about 2 acres under cultivation. One distinctive element of the farm is the fact it consists of roughly two feet of earth sitting on top of the original asphalt surface of the playground. This was done to protect the farm and its crops from contaminants in the soil of the former industrial site (lead and other heavy metal contamination being a constant problem for community gardens). The farm contains the NYC Compost Project in partnership with the Brooklyn Botanic Garden, and also operates largely off the power grid, acquiring electricity from solar panels on-site. They reportedly grew over 20,000 pounds of produce last year, which they sell at their Saturday farm stand market on site and through their CSA (Community Supported Agriculture) program. As mentioned, Added Value also runs the Red Hook Houses Farm, a 1.1 acre educational farm created in 2013 in collaboration with the Mayor’s Office and the New York City Housing Authority, which was the first farm ever on NYCHA property. 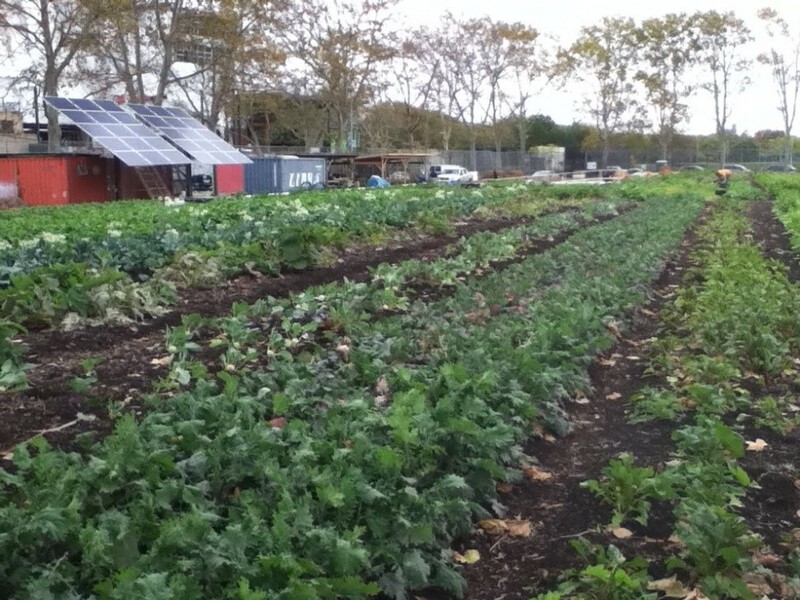 Brooklyn Grange developed its first rooftop farm in 2010 in Queens and its second in 2012 at the Brooklyn Navy Yard. 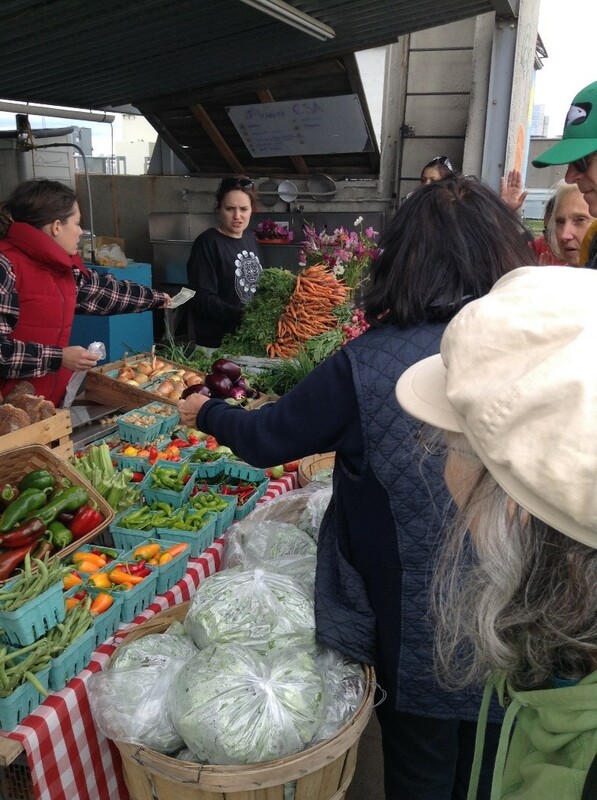 Together they provide 2.5 acres of traditional, soil-based farmland in the city. They also operate over 40 beehives on rooftops in three boroughs. Brooklyn Grange is one of the largest rooftop farming operations in the US and works to fulfill a number of functions including providing fresh produce for city residents as well as education and job training programs for children and adults. Its operations serve as a model for job creation and economic development, and for developing green roof and other green infrastructure systems. According to Gwen Schantz, Chief Operating Officer of Brooklyn Grange, people who grow things in NYC are largely free to do what they want as long as they are simply growing produce and selling it as is. Sales tax is not charged on unprepared or packaged food products, meaning most items potentially sold by gardens or farms would not require them to register as a business. If, however, any processing of agricultural produce takes place, that then falls under the jurisdiction of the New York State Department of Agriculture and Markets, and the people involved must undergo training in food safety and receive certification by the State. This is a three-year, renewable certification. Gwen cited a “great regulatory climate” in NYC, where it is legal to keep chickens (but not roosters), bees, and other such creatures. Aquaculture is also legal, but requires US Department of Agriculture approval and is more difficult to undertake. She also said the lack of zoning restrictions is a great boon to their business, and that their main consideration is the need for the Department of Buildings to certify that the rooftops holding their farms are structurally sound and they conform to the building code. Cities like Philadelphia and Yonkers were cited as having more restrictions and being far less favorable to urban agriculture. Brooklyn Grange works with the City’s Economic Development Corporation on job creation strategies, the Department of Environmental Protection on green roof systems, and the Mayor’s Office of Sustainability on sustainability issues. They also work with a number of nonprofit groups to host visits by children to learn about agriculture, sustainability, and nutrition, as well as job training and immigrant services groups to teach skills and provide therapy. Ms. Schantz also said that although the regulatory environment in NYC is very good, there are really no significant incentives to support the creation of green roofs or roof-top gardening. She said there are state tax incentives, but the numbers don’t work in a way that makes these attractive. In discussing the economics of urban agriculture, Ms. Schantz noted that ‘vertical farms’, using hydroponic or aeroponic systems to grow produce inside buildings, face several hurdles in a place like NYC. Costs for interior space are high and demand is great, and changing (gentrifying) neighborhoods mean that even if space can be leased now, there is a strong chance a business will be evicted in a few years so the building can be converted to more profitable residential or commercial use. The technologies themselves can also be more expensive, adding to the difficulty of recouping costs in a business with very low margins for most produce. This is why, aside from some small-scale efforts, vertical agriculture does not have a significant presence in the city and is not, therefore, introduced in more detail in this report. She did note that these calculations are different in other cities such as Newark (which hosts AeroFarms) or Detroit, where real estate is not in such demand. In NYC, though, she said there is not much competition for roof space, allowing Brooklyn Grange to avoid this issue almost entirely. They have recently signed a new 10-year lease on their rooftop in Queens and a 20-year lease on their rooftop in the Brooklyn Navy Yard, both for reportedly very affordable prices. Gotham Greens is another large-scale rooftop farming operation, but run entirely differently from Brooklyn Grange. Founded in 2009, it focuses on growing salad greens and herbs in fully automated hydroponic greenhouses in New York and Chicago, which are sold through Whole Foods and other stores, as well as green markets, and are also used by a number of restaurants. Gotham Greens built their first greenhouse in Greenpoint, Brooklyn, in 2011, and now has over 170,000 square feet of rooftop greenhouse space across four facilities in the two cities. The greenhouse facilities are run according to federal Hazard Analysis Critical Control Points (HACCP) and Good Agricultural Practices (GAP) guidelines, and are maintained as sterile environments in order to minimize the risk of any food-borne diseases. This also means they cannot allow volunteers to help out with their operations the way Red Hook Farms or Brooklyn Grange do. Though using more energy, they work to maintain a small carbon footprint through utilizing wind and solar energy and avoiding shipping their produce for long distances. Unlike Brooklyn Grange, which uses a fairly traditional method of growing plants in soil in the open, although doing it several stories up in the air, Gotham Greens utilizes a higher-tech, higher-cost, higher-efficiency system to produce more per square foot under more highly-controlled conditions that is, by necessity, more focused on business than community than the other examples noted here. The use of a hydroponic growing system also eliminates the need for herbicides, since no weeds can grow, and beneficial insects such as ladybugs are used in place of pesticides, although, ironically, the produce does not technically meet the standards to be certified as “organic”. It is industrial, in a sense, although in a high-tech, sustainable, natural fashion that could be described as “industri-organic”. It is a version of newer, high-tech, indoor grow-ops like AeroFarms (http://aerofarms.com/) in Newark, but placed on rooftops. This allows them to combine the advantages of growing in a controlled environment while using natural light and air, plus the relative affordability of rooftop space arising from the low level of demand for it. The economics of their operation are further aided by the fact they specialize in growing high-end organic salad greens and herbs for which they can charge a premium price. Gotham Greens does engage in community outreach, supporting job training and community agriculture. However, it does this largely indirectly, through providing support to greening and nutritional education efforts conducted by community groups and schools, rather than by having volunteers or trainees come to its farms. They also subsidize sales of their products in markets in their local neighborhoods at reduced prices. New York is not the only city with urban agriculture, by any means. Across the river, Newark, besides being home to AeroFarms, also has a thriving urban agriculture community. Detroit and other cities suffering from depopulation have also seen citizen and city-supported movements to replace vacant lots with gardens, and green roofs are a standard element of sustainability everywhere. Beyond that, the potential for job creation and skills training have also come to be well-recognized. Examples abound, each somewhat different depending on its city’s situation. Gwen Schantz recommended looking at Lufa Farms (https://lufa.com/en/index.html) in Montreal as a good example of a very successful rooftop urban agriculture operation. Gotham Greens’ largest farm is the Pullman facility, on the roof of the Method soap factory on the Far South Side of Chicago. Among many other rooftop farms in that city is the 20,000 square foot farm built by the Chicago Botanic Garden atop McCormick Place. 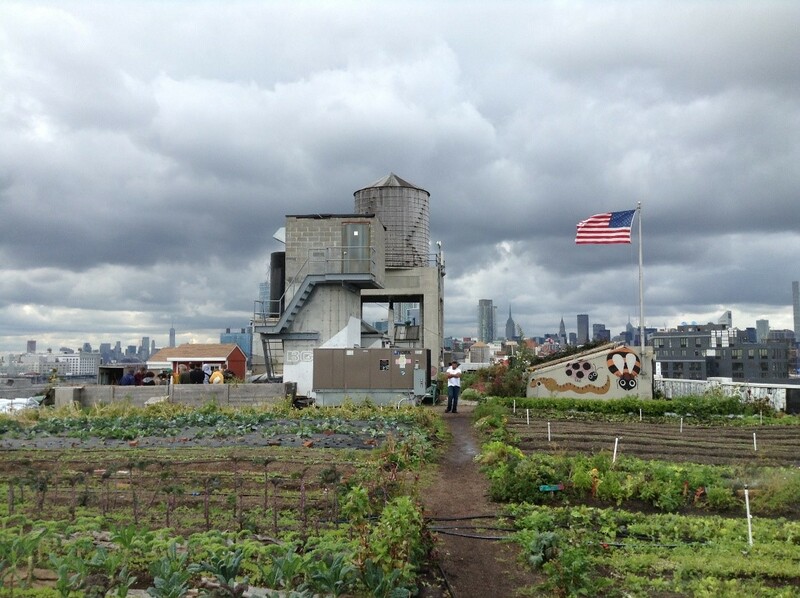 A combination of new technologies, the growing public desire for fresh, wholesome produce, locally grown, efforts to adopt green roofs and other sustainable practices, and an increasing number of successful examples of urban farms should ensure that urban agricultural operations continue to expand across cities around the world – the visible shoots with their roots in New York’s experience of decay and revival. ← We are now accepting submissions for the JET Program Video Contest 2017!